Food: Appropriate size crickets, moths, and flies coated in calcium and vitamin powder. Youngsters should be fed six to ten 2-week-old crickets once or twice a day as a guideline. These lizards grow rapidly and should be fed as much as they will eat throughout their growth phase. It is equally important that their food is coated with calcium/vitamin D3 supplement or they will quickly develop metabolic bone disease without proper nutrition for their rapidly growing bones. Remove any uneaten crickets after feeding. Water: These lizards will not drink standing water from a bowl. A drip system or a waterfall is needed to supply their water. Occasional misting of the plants in their enclosure is also a good idea. This is especially important with youngsters whose enclosure should be misted at least twice a day to supply their water. Watch for sunken eyes, which are a sign of dehydration, indicating a need for more frequent misting. 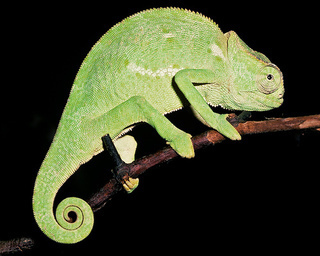 Housing/Habitat: Specialized screened chameleon enclosures are best for these lizards. Cocoterra or reptile turf could be used for display purposes. Landscape to provide basking area with plenty of appropriately sized branches and plants for climbing and cover. SENEGAL CHAMELEON Chameleo senegalensis all livestock will be on customer collection only basis as we will not send animals by mail.